Melissa Apolenis, a graduate student at the University of Maryland School of Nursing, opened class with these questions, intending to make her students think about how hunger personally affects them. 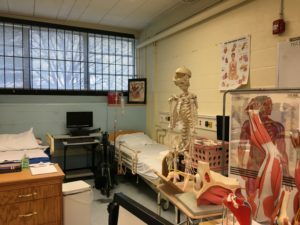 The class was composed of Ms. Caprice Davis’s 11th grade nursing students and Ms. Porshia Seymour’s pharmacy tech students. 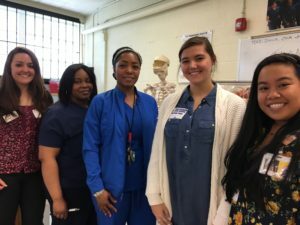 The students and Ms. Apolenis, as well as her colleagues Maria Claver and Jacqueline Castille, also graduate students at University of Maryland School of Nursing, shared what they have experienced personally when they’ve skipped a meal and are feeling hungry: anger, exhaustion, grumpiness and shakiness topped the list. 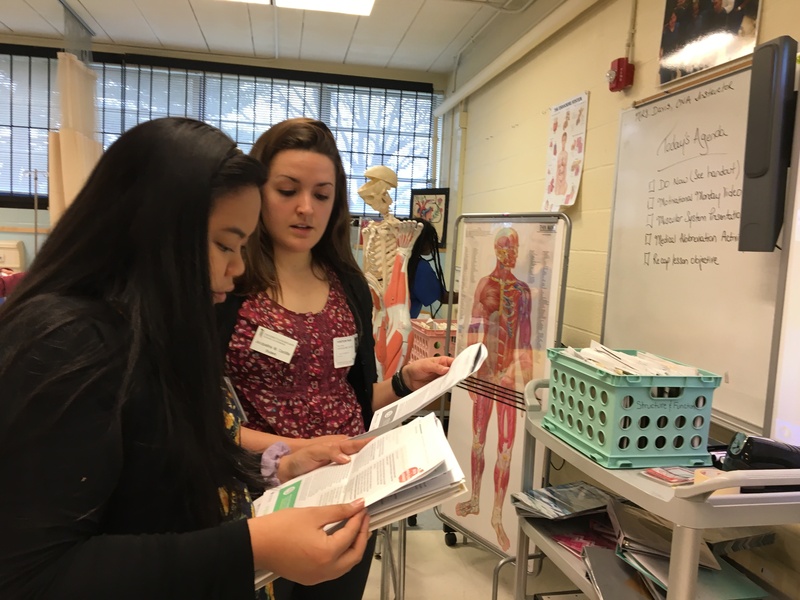 From there the graduate students segued into the FoodSpan lesson on the Maryland Hunger Gap, focusing on food insecurity. Graduate students and teachers at Patterson High School, Baltimore. Ms. Apolenis, Ms. Claver and Ms. Castille took turns engaging the nursing and pharmacy tech students in discussions about people who are most likely to experience food insecurity; the causes and effects of food insecurity; and potential interventions. At one point in the lesson, the instructors asked the students to answer this question: Should universal school breakfast programs be expanded with additional funding? The majority of students answered “yes,” with statements such as, “People are hungry and we need more food,” although there were a couple of dissenting voices. Ms Claver and Ms Castille at Patterson High School. Patterson High School, located in Baltimore City, is a hunger-free school and, like every Baltimore City public school, serves free breakfast and free lunch to all students without the hassle and stigma of applying for aid and showing identification. The Hunger Free Schools Act, sponsored by Maryland State Senator Rich Madaleno, was signed into law in 2017 by Maryland Governor Larry Hogan.